I was given a Sony Handycam several months ago and I stashed it away knowing that one day I’d pull it out and hack it in some way, probably multiple ways. I salvaged some pretty nifty bits from this camera but the coolest was the 20x zoom lens. It has focus and zoom controlled by two stepper motors. 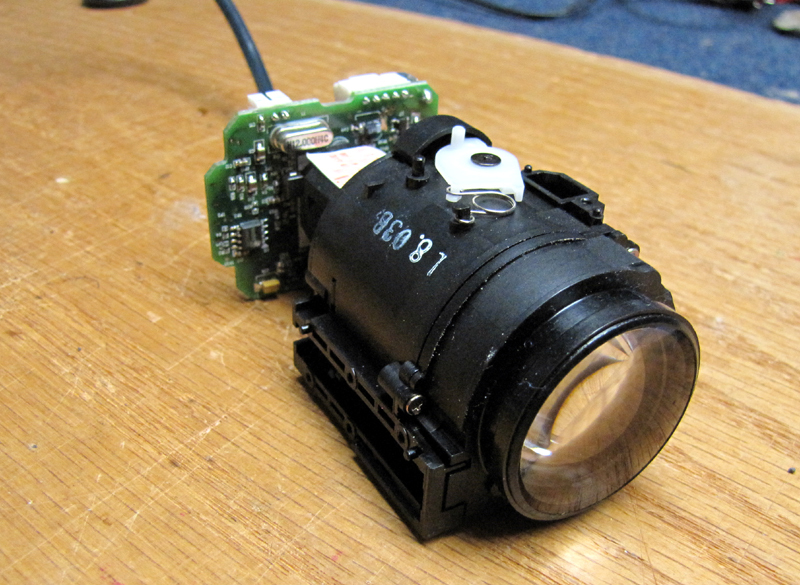 When I removed the CDD I realized that the lens could easily be attached to a different CCD from another camera. Well it just so happens that I had an extra Logitech Quickcam someone gave to me and since I had been inside them before, I knew it would be a good candidate for this hack. With just a bit of modification to the mounting holes on the circuit board, I was able to mount the lens with two screws, nice and solid. I was pleased with the results and I’d like to take the project a step further… pun intended, and connect the stepper motors to a controller so I can get finite adjustment of focus and zoom. Hi! I took great inspiration from this! I sourced a Handycam (faulty) from eBay for a really good bargain, and have the lens mated to a Logitech C120, I even have the stepper motors working from an arduino! What I don’t understand….is there seems to be two home sensors, one each for the focus and the zoom. They have 4 pins but I have no idea how to utilize them, do you have any insights on how these work? That’s cool that you have the steppes working with an Arduino! Way to go! I have no idea how the stop sensors work, but I’ll check them out. Probably an IR sensor.